Tết is celebrated on the same day as Chinese New Year though exceptions arise due to the one-hour time difference between Hanoi and Beijing. It takes place from the first day of the first month of the Lunar calendar (around late January or early February) until at least the third day. 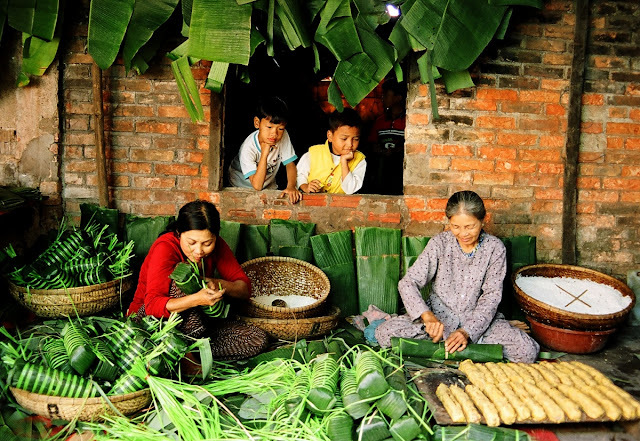 Many Vietnamese prepare for Tết by cooking special holiday foods and cleaning the house. 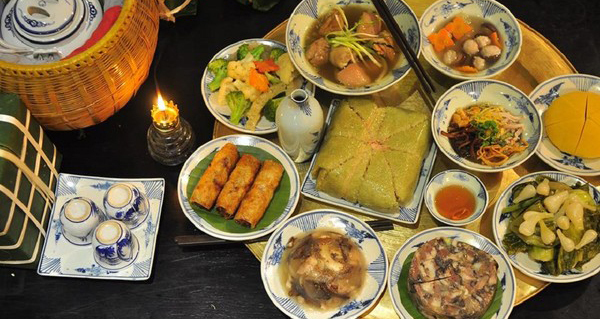 There are a lot of customs practiced during Tết, such as visiting a person’s house on the first day of the new year (xông nhà), ancestral worshipping, wishing New Year’s greetings, giving lucky money to children and elderly people, and opening a shop. Tết is also an occasion for pilgrims and family reunions. During Tết, Vietnamese visit their relatives and temples, forgetting about the troubles of the past year and hoping for a better upcoming year. 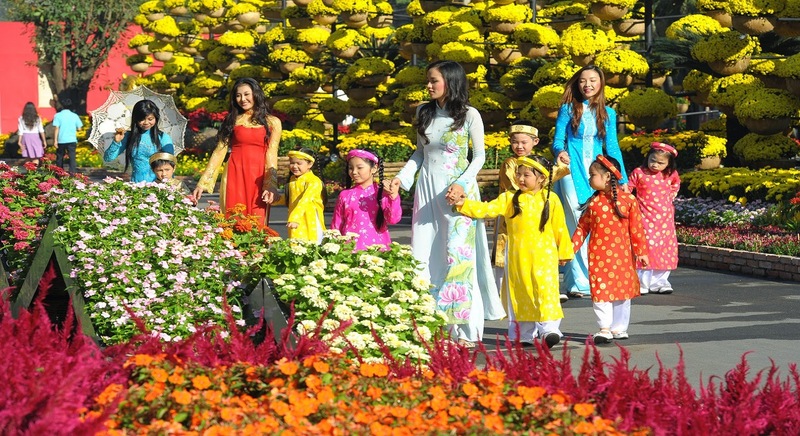 They consider Tết to be the first day of spring and the festival is often called Hội xuân (spring festival). Vietnamese people usually return to their families during Tết. Some return to worship at the family altar or visit the graves of their ancestors in their homeland. Although Tết is a national holiday among all Vietnamese, each region and religion has its own customs. Tết in the three Vietnamese regions can be divided into three periods, known as Tất Niên (Before New Year’s Eve), Giao Thừa (New Year’s Eve), and Tân Niên (the New Year), representing the preparation before Tết, the eve of Tết, and the days of and following Tết, respectively. All of these customs are to celebrate Tết in Vietnam. This period begins one or two weeks before the actual celebration. The general atmosphere leading up to Tết is in the bustle of shopping, decorating the home, cooking traditional Tết food and waiting for relatives to return home. People try to pay off their debts in advance so that they can be debt-free on Tết. Parents buy new clothes for their children so that the children can wear them when Tết arrives. Because a lot of commercial activity will cease during the celebrations, people try to stock up on supplies as much as possible. In the days leading up to Tết, the streets and markets are full of people. As the shops will be closed during Tết, everyone is busy buying food, clothes, and decorations for their house. Vietnamese families usually have a family altar, to pay respect to their ancestors. Vietnamese families have a tray of five different fruits on their altar called “Ngũ Quả”(five fruits type). During Tết the altar is thoroughly cleaned and new offerings are placed there. Traditionally, the three kitchen guardians for each house (Ông Táo) (Kitchen God), who report to the Jade Emperor about the events in that house over the past year, return to heaven on the 23rd day of the twelfth month by lunar calendar. Their departure is marked by a modest ceremony where the family offers sacrifices for them to use on their journey. In the days leading up to Tết, each family cooks special holiday foods such as bánh chưng and bánh dầy. Preparations for these foods are quite extensive. Family members often take turns to keep watch on the fire overnight, telling each other stories about Tết of past years. The first day of Tết is reserved for the nuclear family. Children receive a red envelope containing money from their elders. This tradition is called mừng tuổi (happy new age) in the north and lì xì in the south. 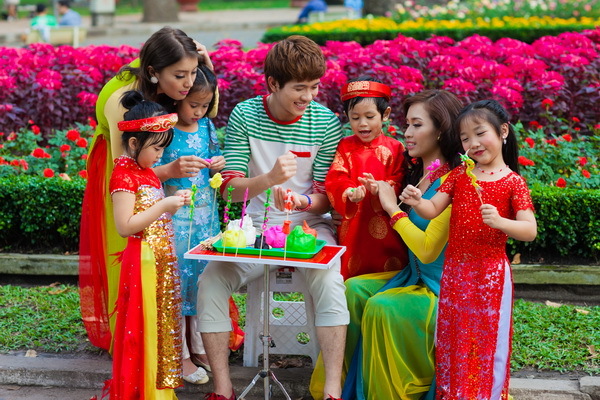 Usually, children wear their new clothes and give their elders the traditional Tết greetings before receiving the money. Since the Vietnamese believe that the first visitor a family receives in the year determines their fortune for the entire year, people never enter any house on the first day without being invited first. The act of being the first person to enter a house on Tết is called xông đất, xông nhà or đạp đất, which is one of the most important rituals during Tết. 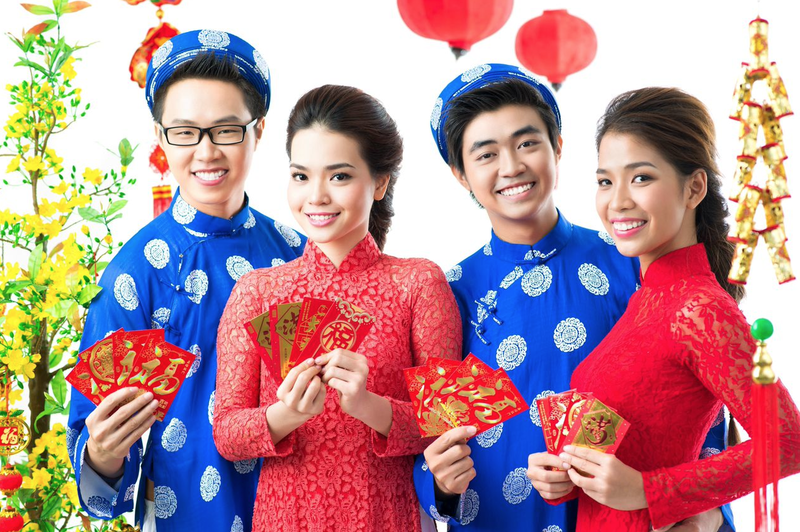 According to Vietnamese tradition, if good things come to the family on the first day of the lunar New Year, the entire following year will also be full of blessings. Usually, a person of good temper, morality and success will be the lucky sign for the host family and be invited first into the house. However, just to be safe, the owner of the house will leave the house a few minutes before midnight and come back just as the clock strikes midnight to prevent anyone else entering the house first who might potentially bring any unfortunate events in the new year to the household. Sweeping during Tết is taboo or xui (unlucky), since it symbolizes sweeping the luck away. It is also taboo for anyone who experienced a recent loss of a family member to visit anyone else during Tết. During subsequent days, people visit relatives and friends. Traditionally but not strictly, the second day of Tết is usually reserved for friends, while the third day is for teachers, who command respect in Vietnam. Local Buddhist temples are popular spots as people like to give donations and to get their fortunes told during Tết. Children are free to spend their new money on toys or on gambling games such as bầu cua cá cọp, which can be found in the streets. Prosperous families can pay for dragon dancers to perform at their house. There are also public performances for everyone to watch. Traditionally, each family displays “Cây nêu”, an artificial New Year Tree consisting of a bamboo pole 5 to 6 m long. The top end is usually decorated with many objects, depending on the locality, including good luck charms, origami fish, cactus branches, etc. At Tết every house is usually decorated by hoa mai – Ochna integerrima (in the central and southern parts of Vietnam) or hoa đào – peach flower (in the northern part of Vietnam) or hoa ban (in mountain areas). In the north, some people (especially the elite in the past) also decorate their house with a Prunus mume tree (also called mai in Vietnamese, but referring to a totally different species from Ochna integerrima). In the north or central, the kumquat tree is a popular decoration for the living room during Tết. Its many fruits symbolize the fertility and fruitfulness that the family hopes for in the coming year. Vietnamese people also decorate their homes with bonsai and flower plants such as chrysanthemum (hoa cúc), marigold (vạn thọ) symbolizing longevity, mào gà in Southern Vietnam and paperwhite flower (thủy tiên), lavender (viôlét), hoa bướm in Northern Vietnam. In the past, there was a tradition that old people tried to make their paperwhite flowers blossom right the watch-night time. They also hung up Dong Ho Paintings and thư pháp (calligraphy pictures). • “Bánh chưng” and “Bánh dầy”: essentially tightly packed sticky rice with meat or bean fillings wrapped in Dong (Phrynium placentarium) leaves. When this leaves is unavailable, banana leaves can be used as a subtitute. Bánh chưng (rectangular) and bánh dầy (circular) are symbolically connected with Tết and are essential in any Tết celebration. Preparation is time-consuming, and can take days to cook. The story of their origins and their connection with Tết is often recounted to children while cooking them overnight. • “Hạt Dưa”: roasted watermelon seeds, also eaten during Tết. • “Dưa Hành”: pickled onion and pickled cabbage. • “Củ Kiệu”: pickled small leeks. • “Mứt”: These dried candied fruits are rarely eaten at any time besides Tết. • “Cầu Dừa Đủ Xoài” – In southern Vietnam, popular fruits used for offerings at the family altar in fruit arranging art are the custard-apple/sugar-apple/soursop (mãng cầu), coconut (dừa), papaya (đu đủ), and mango (xoài), since they sound like “cầu vừa đủ xài” ([We] pray for enough [money] to spend) in the southern dialect of Vietnamese. • “Thịt Kho Nước Dừa” Meaning “Meat Stewed in Coconut Juice”, it is a traditional dish of fatty pork stomach and medium boiled eggs stewed in a broth-like sauce made overnight of young coconut juice and nuoc mam. It is often eaten with pickled bean sprouts and chives, and white rice. People are delighted to enjoy exciting games during Tết: bầu cua, cờ tướng, ném còn, chọi trâu, đá gà, marshmallow toss, etc…They also participate in some competitions presenting their knowledge, strength and aestheticism such as: bird competition and ngâm thơ competition. People can also visit fortune tellers, in temples and in the streets, to have their fortunes told. You must know your zodiac sign and the star you were born under to have your fortune read. Whether the fortunes are taken seriously depends entirely on the person receiving the fortune and the reputation of the fortune teller. These customs come from traditions passed from generation to generation and have become standard. Because of the idea that the beginning will affect the middle and the end of the year, Vietnamese people avoid doing bad things and try to do good things during Tết holiday.